As I lay here tonight, desperately trying to fall asleep, I knew I had to write. I have let too much time pass without sharing. I know someone out there is feeling some of these emotions. I do not often “wear my feelings on my face”, but if you had a glimpse into my world after the day has concluded and all the lights are going out that is when you would be able to see the pain of Traumatic Brain Injury. You would see and hear the tears flow from my eyes, and the desperate cries out to my Jesus to heal our lives, to turn back the clock, to have my husband and life back. I have been struggling with this new life. I am fighting against it as hard as I can imagine. 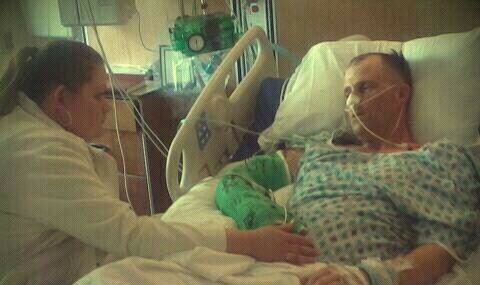 It has been just over 2 years since my husband’s accident. In that time, he has not only reached a plateau of sorts, but also has had significant cognitive (mental ability) decline due to additional complications from post traumatic epilepsy. That is seizures as a result of the trauma to his brain. Clinically speaking, my husband is literally more like a child to me than a partner, companion, lover, or friend. This is of no choice of his own. He cannot fix the lack of abilities despite therapies to try and correct some of these issues. His brain is literally not capable of these things. I keep holding out to a breakthrough, something that will drastically change or miraculously heal him. That one of these days when I so need his love and affection he will turn to me and say how much he loves me and cares for me and most of all that I will see that spark in his eyes again. I look for that deep sense of emotional connection that I miss more than any words can describe. I keep thinking if only “he” would wake-up so that I won’t feel so painfully alone in this life. A pain that is so gut wrenching it feels as though your very heart is being ripped into shreds and all that comes out are cries so intense there is no sound with them. The only movements are of agony and trying to catch your breath. I keep fighting the reality that sometimes, the healing might not come. Despite all that we try to do to improve his condition, there are times when the progression slows or stops. I do not believe this is because of a lack of faith or hope. I still have hope, but I also know that in this world sometimes bad things happen and again sometimes the healing may not be what the world would define as healing. As painful as it may sound, this may be where God’s plan is for John’s life and my life. Even as I write this, I am wrestling with that statement. I think to myself. “Doesn’t He listen to my cries, why would He allow so much pain in my life?” I do not have an answer to this. I can say that I have been feeling the Lord’s love more and more as I dig into the Word and try to make changes in our lives for the better. I cannot say that this has taken away the deep pain that words cannot describe, but it does help to know that Jesus is there and has felt and wept with me. He has held me in my pain night after night. I am going to start to try and let my guard down a little bit more. To be more honest with people when they ask how things are going. I tend to assume people will not want to hear our problems or feel that I have to put on the “happy face” when in reality sometimes I just wish someone would come up to me and give me a giant bear hug and allow me to cry my heart out. I will close with a passage given to me by a very dear friend. I leave my Bible open to this on my nightstand and look to it often for comfort. 14 “Therefore I am now going to allure her; I will lead her into the wilderness and speak tenderly to her. and will make the Valley of Achor [trouble] a door of hope. This entry was posted in Traumatic Brain Injury and tagged Brain injury, Caregiver, commitment, cope, Endurance, Family, God, grieving, Hosea, lonliness, Relationships, TBI, Traumatic brain injury. Bookmark the permalink. Oh Brandy my heart hurts for you and I want to send a Big Bear HUG your way! Continue to keep your eyes on Jesus he will be with you always. I pray for you to be enveloped in the strength and peace that only our Heavenly Father can give. Hang in there… I have reached a number of plateaus over the past 9 years since my TBI in 2004, and my spouse had pretty much given up on me, several years after my injury. Miracles can happen, and we often discover things we never guessed were possible — totally by chance. One thing that has helped me in so many ways is getting regular exercise. I have issues with being outside where I run into people and have to interact — it’s pretty stressful for me, especially on beautiful days when there’s lots of sun and noise. But I have an exercise bike I use, and when I just ride for even 10 minutes, my thinking is clearer, my mood is better, and I can feel myself “growing up”. For your husband, don’t give up that he can change. I myself behaved very childlike for a number of years. I don’t have epilepsy, so I don’t have those issues — that is VERY tough — but I really slid back for several years after my TBI in 2004. By changing my diet to remove a lot of junk food, carbs, and sugar, I stabilized my system quite a bit – not so many food-related highs and lows helps me keep an even keel. Recovery from brain injury is literally like being a child again and re-growing the connections in our brains to re-teach them to function the way we want them to. This is a natural ability our brains have – we just don’t think we have it. Oh, one last thing (sorry I have gone on so much) you may want to check out GiveBackLA — they have information about brain injury and recovery for family members as well as TBI survivors — http://www.givebackla.com/?cat=4 — I have found them so helpful — they’ve made a 1000% difference in my life, just by giving me the information I need to both understand TBI better — and Take Action! Be well and God Bless! It is always great to hear from a survivor! I will not ever give up on my husband. I am trying to accept where he is in his journey. I fell this is important in order to help him more in the long run. It is not that I do not believe we can still work through some of the difficulties, but rather so I do not get frustrated with false expectations, or put too many demands on him. I want to set him up for success, not failure. I hope your spouse has taken a turn for the better if still in the picture. I will check out the website! Thank you for your feedback too!